Whether you are a student or work in an office, sitting at your desk for long periods of time is not ideal. Poor setup of a desk or work space can lead to poor posture, which in turn can lead most commonly to back pain, RSI (repetitive strain injury), neck tension and headaches. These five simple suggestions can greatly improve your posture and help reduce the associated muscle tension and pain you may be experiencing. One of the biggest contributors to neck tension and headaches is when you are sitting with your head projecting forward. When sitting, your ears should be in line with your shoulders, and your chin slightly tucked in. Relax your shoulders, don’t hunch or roll them in. Computer screens should be directly in front of you and elevated so that the top third of the screen is at or slightly below eye level. Your chair should be at a height that allows you to sit with your feet flat on the floor. Do not cross your legs or ankles. Elbows are at desk height or slightly below, wrists and forearms are in a straight alignment to the fingers. The back of the chair should be slightly reclined at 100 – 110o. When sitting, make sure your bottom is right back in the chair and try to keep your back in contact with the back rest. When manoeuvring the mouse, the action should come from the elbow, not the wrist. Keep your elbows close to your body and the mouse as close to the keyboard as possible. Regular breaks will relieve your muscles and allow you to move around, change positions and stretch out any aches and pains. Consider a quick three minute routine of back twists, neck stretches, forward bends and pec stretches throughout your day. Even with the best of intentions, we can still suffer muscle tightness and pain. Emotional stress is a part of our life and will often lead to physical tension and soreness as well – most commonly neck pain, upper and lower back pain and even a tingling sensation in the arm or fingers. 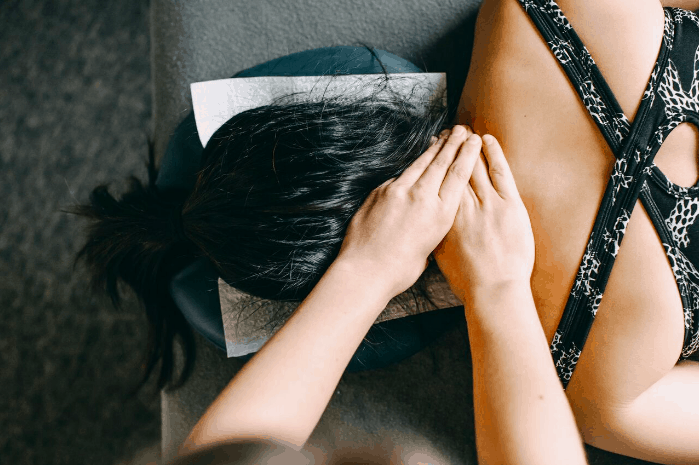 A regular remedial massage is a great way to ease that tension both physically and emotionally. Whilst it’s not always possible to avoid working at a desk, we can improve our workstation setup. Combined with some active stretching, massage and postural changes, aches and pain can be relieved. Not sure if your workspace is ideally setup? Life Ready Physio can visit your workplace to provide onsite assessments and recommendations to optimise your work health environment. For more information on Life Ready Onsite, call 9322 1146, book a remedial massage with your local team, or book online now at your closest Life Ready clinic.